This striking villa resort on Bulgaria's Black Sea coastline incorporates a first-class Gary Player Signature championship golf course and provides you with modern, luxurious accommodation that enjoys breathtaking views from its cliff-top position. 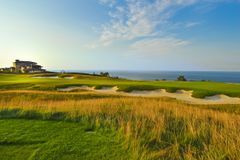 Perched high on the cliffs of Bulgaria's Black Sea coast, BlackSeaRama is starting to enjoy an equally lofty position as one of the most revered new courses in the world. BlackSeaRama is the first championship signature golf course in Bulgaria and, despite many new courses being planned for the country, it will almost certainly remain one of the best. Working with largely flat terrain, Player produced 18 beautifully self-contained holes which are separated by towering hillocks, or water and sand. There's also an elegant Tuscan-style clubhouse and four artificial lakes within the complex each stocked with a different species of fish. As is usual when a course is close to the sea, the wind is often a significant factor, and Player has taken the wind into account beautifully with this layout, which was voted "Best New International Course" by a prestigious US magazine in 2009. Player's layout winds its way over the cliffs, which tower up to around 500 feet, providing great golfing challenges and some stunning views over the Black Sea at the same time. Situated 40 minutes drive from Varna International Airport and close to three of the most famous sea resorts in Bulgaria, this 7,200-yard, par-72 course has multiple teeing areas to cater to different ability levels. It is the first completed project of Gary Player in Eastern Europe, but it won't be his last, as this design has so impressed the locals they've asked him to design another course up the road, called Thracian Cliffs. BlackSeaRama offers a complex of luxurious villas equipped with all the little luxuries that make the resort a very pleasant base for a golf break. BlackSeaRama Golf & Villas has 28 detached or semi-detached villas, all of which are air-conditioned, come with individual designer furnishings, have two bedrooms and bathrooms, and are equipped with kitchens, remote control plasma TV and direct dial telephones. There are also a number of Premium Villas that come with three bedrooms for up to parties of six, while Deluxe Private Villas can accommodate parties of up to eight people. There are restaurants on site, but room service is available, as is food delivery from the resort's shop. The villas are located close to the sports centre and the fishing lake, with its picnic and BBQ area. A short walk away is the pool with long chairs, the Bell Tower Bistro, the Clubhouse Bistro and the Clubhouse Gourmet Restaurant. Elsewhere in the resort you'll find a gym, tennis courts and horse riding facilities. Black Sea Rama is an accessible area for a holiday. Varna international airport is just 30 minutes away and the city itself has extensive shopping facilities, theatres, restaurants, bars and many other tourist attractions. The historic fishing port of Balchik and the renowned Golden Sands beach resort are also within easy access, offering a whole range of facilities for holidaymakers.